The 2015 Fringe was incredible. I felt like I was somehow cashing in all my chips from my previous years of flyering, bucket shaking, and running shows into one big, epic, media-splattered Fringe. Thank you everyone who came to my shows, wrote nice things, had a pint or a meal or a chat with me after the show. It was a hell of a ride! I was interviewed by Three Weeks Magazine and Broadway Baby about Asking Nicely. 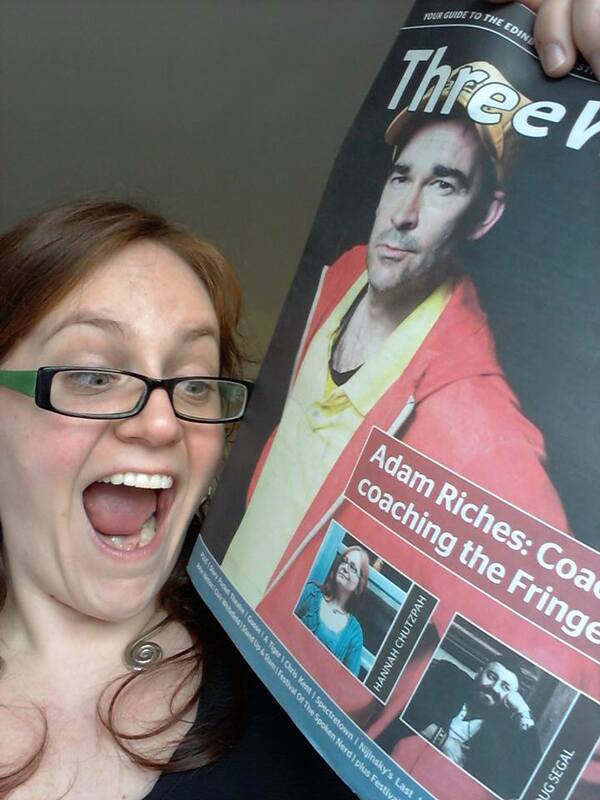 I even wound up on the front cover of Three Weeks Magazine – which I didn’t even know poetry shows could aspire to! Thanks to Loud Poet Carly Brown for the Broadway Baby interview, & Kat Gollock who took these gorgeous photos. You can see more of Kat Gollock’s photography here. “In her funny and articulate show, Hannah Chutzpah presents her considered and inspiring take on the complexities of power and permission. Through poems that are tightly crafted stories and chat that’s amusing and well-researched, she contemplates how social class, gender, race and personality all have a part to play in the risks we feel able to take in life. Telling the story of her own personal journey from isolated teen to confident performance poet, she reflects on privilege in all its forms and hypothesises on the thorny issue of social conditioning. Feminist Festival did a lovely write-up of my show and Agnes Torok’s ‘If You’re Happy and You Know it Take This Survey’ – on just before my show at the same venue (it was a happy accident, but we made a great double-bill). Zosia Jo picked out Asking Nicely as one of the top feminist shows at the Fringe. The Twitter feedback blew me away. After the run was over, an audience member got in touch to tell me they were looking for a new job after seeing the show. They said “You gave me permission to look after yourself.” I don’t really have words for what that means to me – but thank you so, so much for letting me know. The Fringe is bootcamp for the performing arts and I know I’ve got better every time I’ve gone up as a performer. Partly this happens because you’re practicing every day, (I’d never had to figure out sounddesks before, or finish a show outside before – but the whole audience followed – both times) partly because you’re seeing other great shows every day, and partly because acquaintances and cool people you’ve seen on stage become your peers – a community builds – and that in itself gives you more confidence for what to do in the year ahead. I’m certainly delighted that a lot of people I respect and admire came to see me doing a piece of work I’m very proud of, and there are a lot of poets I have even more respect for having seen their brilliant shows. And then we chatted down the pub and hugged and YAAAAAY. I don’t know what the future holds, but I’m definitely standing taller and aiming higher than I was before. Thanks everyone. I’ve had a blast. Posted in Arts, Asking Nicely Show, Blog, Feminism, ShowreelTagged Asking Nicely, asking nicely show, Edinburgh Fringe, poetry, showBookmark the permalink.